RF transformers are widely used in low-power electronic circuits for impedance matching to achieve maximum power transfer, for voltage step-up or step-down, and for isolating dc from two circuits while maintaining ac continuity. They are also used for common mode rejection and as baluns. Essentially, an RF transformer consists of two windings linked by a mutual magnetic field. When one winding, the primary has an ac voltage applied to it, a varying flux is developed; the amplitude of the flux is dependent on the applied voltage and number of turns in the winding. Mutual flux linked to the secondary winding induces a voltage whose amplitude depends on the number of turns in the secondary winding. By designing the number of turns in the primary and secondary windings, any desired step-up or step-down voltage ratio can be realized. Mutual coupling is accomplished simply with an air core but considerably more effective flux linkage is obtained with the use of a core of iron or ferromagnetic material with higher permeability than air. As an example, if Z equals 50 ohms and the turns ratio equals 2, the secondary impedance equals 200 ohms. In this case, the secondary voltage is twice the primary voltage and the secondary current is one-half the primary current. The basic phase relationship between the RF signals at the transformer input and output ports may be in - phase, 0 degrees, or out-of-phase, 180 degrees. Conventionally, the ports that are in-phase 1, and 3, are marked by dot notation as shown in Figure 2. Ports 1, 4 and 2, 3 are out-of-phase, 180 degrees. Mini-Circuits' transformers are physically assembled by winding a pair of twisted wires around a ferrite toroidal core. 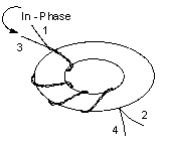 The ends of the primary and secondary wires which leave the same side of the toroid are in the in-phase ports. See Figure 3. For transformers that have a secondary winding with a center-tap, the schematic representation and dot locations are shown in Figure 4. In this case ports 1 and 3 are in-phase, 0 degrees, and ports 1 and 6 are out-of-phase, 180 degrees. These transformers may be operated as low as 12.5 ohms at the primary with essentially the same impedance matching ratio and only a slight change in frequency response. For convenience, all Mini-Circuits transformers are specified as a step-up. For each RF transformer model, the minimum and maximum frequency is given for the insertion loss at the 3 dB, 2 dB and 1 dB points, as shown in Figure 5 and listed in the data chart. 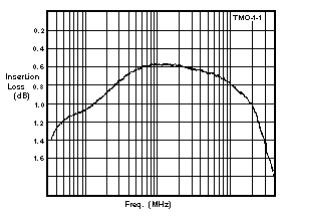 For example, the T1-1 insertion loss is 1 dB from 2 to 50 MHz and 3 dB from 0.15 to 400 MHz. Coaxial connector models are available from 5 KHz to 500 MHZ and are offered with 50 ohm and 75 ohm impedances; 75 ohm connectors are used at 75 ohm ports. The FT1.5-1, with unbalanced input and output is especially useful for 50 ohm to 75 ohm matching applications. The FTB series with unbalanced output and balanced input as shown in Figure 6 (connector ground insulated from the case) helps eliminate ground loop problems, especially when long cable runs are involved. In some applications there is a need to pass a relatively high DC current through the primary winding. In this case, the transformer core may saturate resulting in reduced transformer bandwidth and power handling capability. Mini-Circuits TH series of transformers are designed to handle up to 100 mA in the primary winding without appreciable saturation and change in RF characteristics. Transformer core saturation is influenced by (1) DC current through the winding, (2) RF input power, and (3) frequency of operation. These three variables interact to affect the point at which saturation occurs. 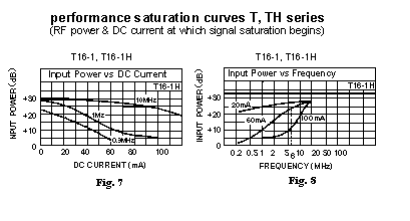 See Figures 7 and 8 in which conventional transformer saturation is compared to the TH series. Mini-Circuits has developed many special transformer impedance ratios and configurations where high DC current is passed through one winding of the transformer. Many of these designs have been for open package surface-mount requirements. Consult our Applications Department for your particular needs. is a measure of the absolute difference in signal amplitude between each output of a center-tapped transformer relative to the center-tap. is a measure of the difference in signal phase between each output of a center-tapped transformer relative to the center-tap. is the amount of power lost through the transformer under matched conditions. is a transformer that has a balanced input, where both ports are isolated from ground, to an unbalanced output where one side is connected to ground. is a transformer where the secondary winding also comprises a portion of the primary winding. 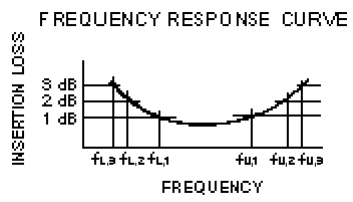 is the frequency range over which insertion loss is less than 1dB referenced to the midband insertion loss. Q: Explain the difference between DC-isolated and non-isolated transformers. A: A DC-isolated transformer is one that does not allow a DC current to pass between the primary and secondary windings. Q: Mini-Circuits transformers are tested with 50-ohm systems. How do they perform at other impedance? Q: Are Mini-Circuits' transformers step-up or step-down? A: All Mini-Circuits transformers are specified as step-up transformers. However, they are tested both ways and may be used as a step-up or a step-down. Q: Can I just use one side of a center-tapped transformer? A: Yes. You may use one side of the transformer but you should remember you will obtain only one fourth of the impedance ratio. Q: Can Mini-Circuits supply MIL-tested transformers? A: Yes, Mini-Circuits' hermetically-sealed TMO transformers meet military needs. Please submit your environmental requirements to Mini-Circuits for review. Q: What are the effects of temperature extremes on Mini-Circuits transformers? A: The permeability of the core is influenced by temperature. As the temperature decreases, there is a change in the permeability causing an increase in the insertion loss at low frequency. As temperature increases, the permeability increases thereby slightly decreasing insertion loss at low frequency. This is true, however, as long as the temperature does not increase above the Curie temperature of the core. Mini-Circuits' designs use cores that have a Curie temperature much higher than the highest specified operating temperature. Q: Explain the reasons for low-end and high-end losses of a transformer. The low-end loss is heavily influenced by the primary inductance while the high-end loss is attributed to the interwinding capacitance and series inductance. Q: How do I measure the insertion loss of a transformer? A: The insertion loss is measured on two transformers connected back-to-back (impedance matched) and dividing the resulting insertion loss by two. Q: Can I build a power splitter with Mini-Circuits' transformers? A: You can use the Mini-Circuits' T2-1T, to create a 50- ohm, 180 degree power splitter. The isolation between output ports and the output return loss of each port will not be as good as a MiniCircuits' standard power splitter. Q: What are the breakdown voltage ratings of Mini-Circuits' transformers? A: Mini-Circuits does not typically specify a break down voltage. However, many of our transformers are able to handle up to 1000 VRMS. Please contact the factory about the transformer of your choice.